Diverse and daring modern jazz from a fine trumpeter and composer. Terence Blanchard is a man with a working quintet that comes out of the “straight-ahead” hard bop of Art Blakey’s Jazz Messengers but isn’t afraid to incorporate electronics, daring harmonics, or grooving permutations of tempo-shirting and complex structure. He is also a man who writes film scores and composes, who ventures beyond. In other words, he’s a model modern jazz player -- not pigeonholed as “traditional” or “avant-garde” or “fusion” or any other one thing. But that’s the challenge, of course. How can you be your one true self when you’re so many different things at once? Magnetic gamely answers this question, standing in a sequence with a series of other fine Blanchard albums from recent years. Blanchard has wisely (and at some cost, no doubt) kept together a working quintet for something like a decade, and he has documented the group in various forms (often augmented by guests) on albums dating back to 2003’s Bounce (also on Blue Note), 2005’s Flow, 2007’s A Tale of God’s Will, and 2009's Choices. It’s been a daring and varied stream of discs united by beautiful writing that has come from many different members of the ensemble. This latest band features longtime associates and wonderful newer ones. 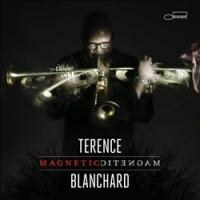 Kendrick Scott has been brilliant and propulsive on drums for ten years with Blanchard, and he is essential on Magnetic. His tune “No Borders, Just Horizons” is a kaleidoscope of cross-rhythms with a deceptive melody -- simple but woven in a complex structure. It’s a model piece of modern jazz, inspiring improvisations that push the rhythm section into a conversation with the soloist. On Blanchard’s “Central Focus”, Scott dances on every part of the kit, from the ride and snare down to his kick drum, with equal dexterity, so that what starts as a simple-sounding theme develops into vintage post-bop. Brice Winston’s “Time to Spare” moves so fluidly and brilliantly from one feeling or time to another that the comparison you can’t avoid is, of course, that Kendrick Scott sounds like Tony Williams -- or his logical successor. Simply one of the best. But the stand-out member of the regular quintet is probably pianist Fabian Almazan. On “Time to Spare”, it’s his solo that seems to equal the kind of thing that Herbie Hancock did with Miles Davis and Tony Williams in the 1960s or that Danilo Perez has been doing in the current Wayne Shorter Quartet. Almazan’s improvisations have an orchestral sweep or structure, so that he's not merely spinning melodic lines with his right hand but actually sculpting whole ideas before your eyes. On his own “Pet Step Sitter’s Theme Song”, his accompaniments to other soloists have the integrity of solo statements, knotted as they are with interesting voicings and textures. On his own solo, he sets up a riveting contrast of different styles that jab and fly, spark and slickly take your breath away. As a composer, he is truly diverse in style and method. “Another Step” is a groove setting for Blanchard’s processed trumpet solo -- a playground of textures and rhythms that pits Lionel Louke’s guitar and Scott’s drumming against keyboard landscapes. But “Comet” is essentially a piano solo orchestrated by some synthesized textures -- a discursive and intelligent essay in music. The newest and youngest member of the band gets a lovely showing as well. Bassist Joshua Crumbly is just 21, a Julliard kid whose tender “Jacob’s Ladder” suggests maturity and lyricism. And the guests here are a treat. The dean of the acoustic bass, Ron Carter, plays on two tracks, including the piano-less “Don’t Run”, where Blanchard is paired in the front line with Ravi Coltrane’s soprano saxophone. The three of them have a good old romp across a stuttering semi-blues structure, creating a moment that feels quite a bit like the old one-off showdowns between friend rivals -- think of Coltrane’s appearance on Rollins’ “Tenor Madness” from fifty-plus years ago. Of course, there is Terence Blanchard himself. He is everywhere here, doing wonderful things in different forms. His tunes are daring, his playing is rife with invention, and he experiments with sounds and arrangements that go outside the “jazz quintet” norm. Yet he does all of this while still maintaining a band in the old Art Blakey style -- developing and encouraging young talent in a way that furthers the art form. I’m not a fan of every choice that Blanchard makes here, of every effect he puts on his horn, of how he arrays Louke’s unusual guitar sound in the ensemble, of how he makes the sound of the band more dense with some synthesized textures. But I’m passionate about the fact that Terence Blanchard is making records that take these risks -- that he isn’t afraid to meld the Miles Davis Quintet of 1965 with ideas and sounds that are new and that originate in his own art. Blanchard is moving jazz forward, which is the only direction it knows. Magnetic sounds like it has the right direction in mind.